It’s fair to say there’s nothing really Robbie Farr needs to add to his resume. The Gold Coast based Sydneysider has a glittering array of Sprintcar and Speedcar achievements that are the envy of most Speedway competitors in the southern hemisphere. A World Series Sprintcars Championship, Australian Sprintcar Championship, Australian Speedcar Championship and an Australian 360ci Sprintcar Championship, an Ultimate Sprintcar Championship, USC SA, QLD and NSW Championships to name only a few, the gritty Farr could be forgiven for slowing down. Instead Farr, who recently opened up his own coffee shop with wife Sonya on the Gold Coast, is tackling one challenge he wanted to check off his list. Actually, it’s an Ultimate Speedway Challenge. The ECP Team are about to take delivery of a Late Model Sedan that Farr will enter in the Ultimate Speedway Challenge that will be held across six rounds between Hi-Tec Oils Toowoomba Speedway, Murray Machining & Sheds Speedway and Valvoline Raceway. The unique concept will feature Ultimate Sprintcars, Speedcars and Late Models and offer spectacular incentives to drivers who may possibly win in two or even three different categories on the night. Farr has had a brief skid in Late Models before. 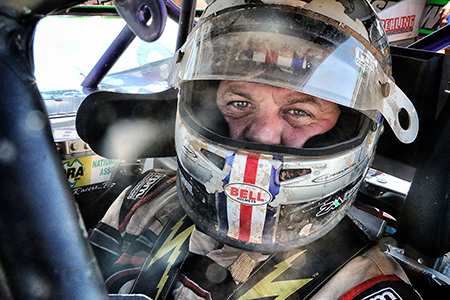 He hot lapped Newcastle racer Nathan Disney’s car at a special media day for NRL football heroes to have a skid at Valvoline Raceway three years ago. At the time Farr quipped that the Late Models were something that always intrigued him and the challenge of racing them was not something he took lightly. Very few drivers in the world of Speedway tackle both Sprintcars and Late Models together because of the unique differences in how they handle. The world’s best Sprintcar driver Donny Schatz does it in the USA but very few others even attempt it. The addition of Robbie Farr to the Ultimate Speedway Challenge in Late Models and Ultimate Sprintcars is a tasty proposition to what was already a mouthwatering concept. The team takes delivery of the Late Model from the USA soon.